Norse Warrior appears to be a game inspired by the Nordic warriors, but it looks more like a King, thanks to the unusual amount of jewels used in the weapons, even the shield coming with some kind of ruby in it. The quality of the design will probably give you a good reason to try the game out, but you might find the presence of the poker cards annoying. Still, despite their presence the game has a warrior theme that plenty will love. The slot was created by WMS. 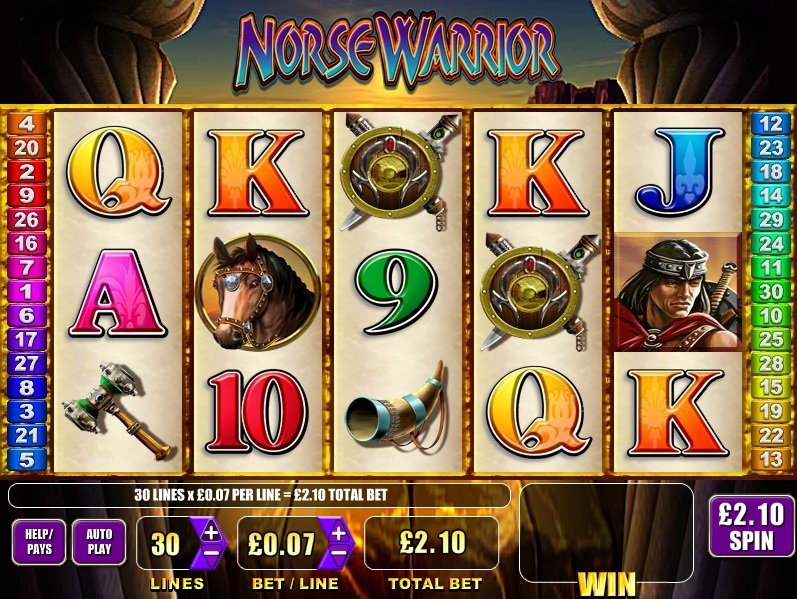 The reels of Norse Warrior present you with a total of 30 bet lines. 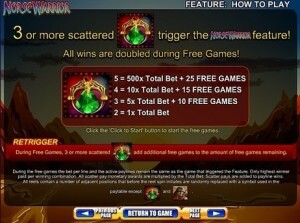 The features will give you multipliers, wilds, free spins and a scatter. Up to $75,000 in prizes can be won inside, a much more impressive figure than I’m used to seeing in WMS slots. You get a decent spread of features in Norse Warrior, with wild symbols being used, with scatters, free spins and even multipliers. We have the image of the Norse Warrior himself in the symbol with the wild powers. Allowed to appear only on the reels 2, 3, 4 and 5, the wild is only used as a substitute for the other symbols, the exception being the scatter of course. Not being present on the first reel, you’re not going to get paid by landing a full combo of wilds. The other feature symbol, which you will recognize by the green emerald that is encrusted in some kind of jewelry, would be the scatter. Have enough of these symbols present on the reels, without mattering where exactly, and your reward will consist in both cash prizes and in free games. The prizes vary between 1x the total bet and 500x. You need at least two scatters for the minimum, and up to five for the biggest prize. Free spins are offered for the same scatter symbols that give you cash, but you need three or more to get this feature started. 10 free spins are given for three scatters, 15 for four and 25 for all five. 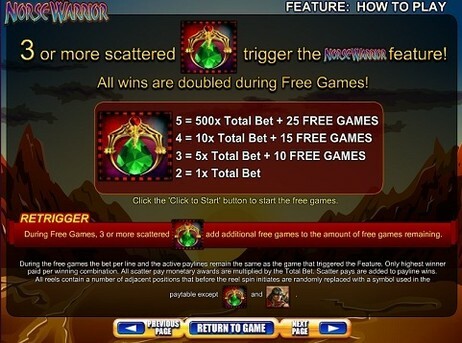 The wins you get during the free spins are doubled, a 2x multiplier applying to them. To retrigger free spins, you need the same 3+ scatters to appear again. Since there are 30 win lines in Norse Warrior, the number of coins which have to be used is a similar one. You may modify their value as you see fit, but you are limited to the range which the game uses, between $0.01 and $5. When everything is at its highest setting, the bets reach values of $150. The scatter symbol will pay the best in this game. You can expect up to 500 times the total bet as a reward from it, which would mean up to $75,000. 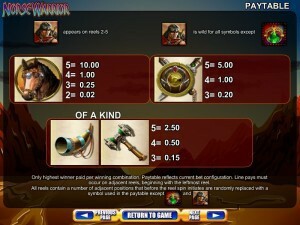 The design seems fit for a Viking warrior themed slot machine, but it could work equally well for a game that is inspired by Conan the barbarian. There are all sorts of items that the Norse Warrior would carry, from the shield, to hammers or horns. A big percentage of the paytable is occupied by playing cards unfortunately, and if they were themed it wouldn’t have been a big problem, but that’s not the case. Symbols: Norse Warrior (wild), Emerald Jewel (scatter, 500x total bet), Horse (1,000 coins), Shield (500 coins), Horn (250 coins), Hammer (250 coins), Ace, King, Queen, Jack and 10. It’s an older design, and the vintage influence might not be a favorite of a lot of players, but the game offers incredible rewards, much higher than what WMS typically includes in slots it releases. 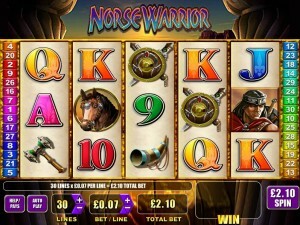 Norse Warrior can be found at any WMS casino, where you get a chance to play it for real money or in free mode.